Sign up now and start making free VoIP calls in just a few minutes! 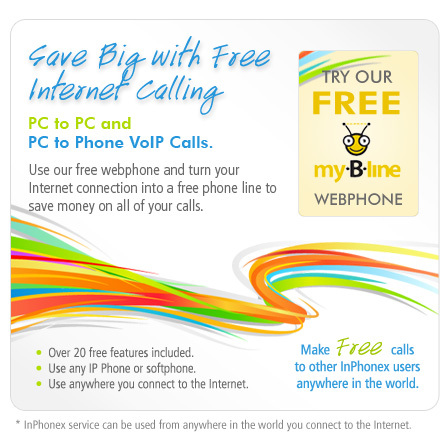 Free Internet Calling plus Pay As You Go Account with $9.95 PC to Phone Long Distance call credit. With InPhonex you can talk to anyone in the world, free of charge, for as long as you want. You can use our free webphone with your computers speaker and microphone, a headset or bring your favorite Internet telephone, it's up to you. Use your Internet connection to make free phone calls to any InPhonex member, anywhere in the world for free. Tell all of your friends and family and eliminate your phone bill. Want to totally replace your existing phone service? InPhonex also offers inexpensive Pay As You Go Calling and Unlimited Monthly Calling Plans to regular phones. Use this free voip service to make Internet faxing to your office across town or world for free. Make free internet calls to any other InPhonex user. Tell all your friends and family to join so you can talk free no matter where they are located. Add another phone line without any expense. Teenagers can use a Free Internet Calling account as their own line and talk to their group of friends as much as they want, free of charge. Have two teenagers in the house? No problem. Just sign up for two Free Internet Calling accounts using two separate email addresses. Your phone number follows you wherever you travel. As soon as you plug in your IP phone or launch your soft phone, your InPhonex phone number is registered with the system and you can make or take calls no matter where you are. For example, imagine the amount of money you can save by bypassing the ridiculous rates hotels charge you to make calls. If you would like to take the next step in making your IP phone even more functional with PSTN bridging, you can always upgrade to our Pay-as-you-go Calling plan.